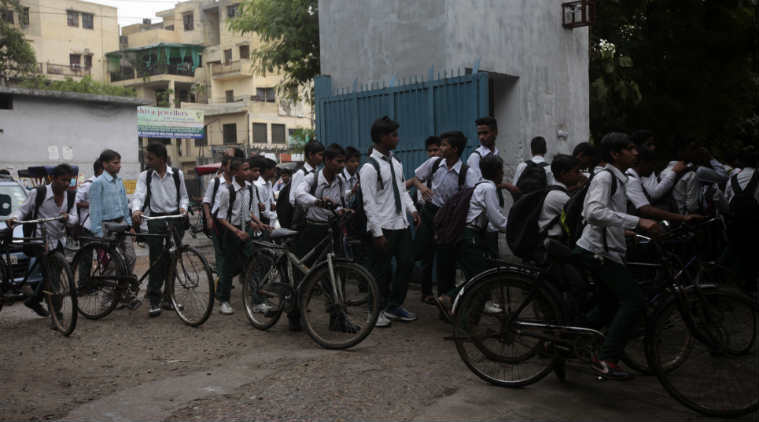 The Directorate of Education (DoE) will undertake a data gathering exercise of students from primary and middle schools in the city to facilitate their admissions to Delhi government schools in classes VI and IX. Government primary education in Delhi is predominantly under the MCDs, which run around 1,700 schools. MCD schools do not teach beyond Class V; lakhs of children have to be transferred to government schools thereafter. The process requires close coordination between the two bodies — which are often at loggerheards with each other — to ensure that no child is dropped out of the school system. The required details include gender, medium of instruction, parents’ names, address, mobile number, Aadhaar number (if available), bank account details (if available) and religion. The data is required to be submitted to the DoE by January 25, following which a mapping exercise will be carried out at the zonal level, linking these ‘feeder’ schools and students to the appropriate ‘parent’ government school, based on proximity, gender and medium of instruction. “Every year, we gather this information from the U-DISE (Unified District Information System for Education). This year, this data was not uploaded by any school due to a change in the format which is why we are collecting it directly from schools,” a DoE official said. Once the data is collected, a designated teacher from the ‘parent school’ will visit each ‘feeder school’ on or before March 15 and distribute “welcome sheets” with details of the parent school and listing documents required to the students concerned. While the exercise is meant to ensure that no child is left out, students will not be admitted by the parent school if the school fails to upload their information. Students will also be invited to their respective ‘parent school’ to familiarise them with the new campus before the admission process ends on April 16.